The European Individual Women's Championship gains momentum. No extraordinarily sensational results were registered in Round 2; some of the obvious favourites, like the former champion Antoaneta Stefanova lost half a point. 36.Qh6+! 1-0 Black resigned (36...Bxh6 37.Ng5+ Kh8 38.Rh7#). From other games we selected duel between Romanian and German players who competed in Alekhine-Chatard attack in French defense. White played inaccurately (14.Rdd1?!) and soon lost. Apparently, it should have taken the risk of playing 14.Qxc4! with great complications. Check out second round games. A number of interesting, full of fight games were played by the participants of the EIWCC in Round 9. The reigning champion Honag Thanh Trang lost a game (against Natalia Zhukova) and all chances to defend the title. And here's an example from the category of crafty traps. The 4th round of the European Individual Women's Championship has been held in Plovdiv today. There was no fight at all in one of the central encounters between Stefanova and Mkrtchian: the players repeated move to move the game Andriasian - Grigoryan in which White makes perpetual check after some nice combinations. The Belarusian Chess Championship finished in Minsk. 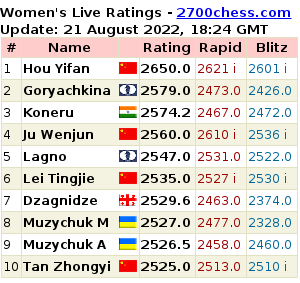 The only female participant Anastasia Ziazulkina had a successful start but by the end of the tournament stuck and managed to take only a point in four rounds. As a result she finished 9th. Kirill Stupak, on the contrary, took advantage of the finishing part of the tournament which eventually decided the winner of the championship. Stupak gathered 9 out of 13, Alexey Aleksandrov stayed half a poitn behind, while four players gathered 8 points. Belarusian Chess championships among men and women are held in Minsk. Anastasia Ziazulkina decided to participate in men's section: after Round 7 she has +2. She has defeated Sergey Zhigalko (2682, the rating favourite), Valery Smirnov (2327, after loss to Anastasia, he withdrew), Aleksandr Kocheev 2391; Ziazulkina has lost only in Round 1 against Vitaly Teterev (2507). Three of obvious favourites at the European Individual Women's Chess Championship taking place in Plovdiv, Bulgaria couldn't win in Round 1 with black pieces. 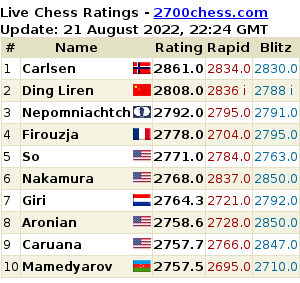 Among them is the reigning European champion Hoang Thanh Trang. She went on with her favourite French defence against Tereza Olsarova and got a winning position quite soon,however, eventually she missed the advantage.